Rachel recently emailed me and and mentioned her blog (Useful Beautiful Home). I popped over and thought it was super cute ! I was then flattered and happy to see my blog button on her sidebar- so sweet! I always take note of that because it’s really thoughtful to show your support for other bloggers. If you have my blog button up on your blog, please email me to let me know so I can acknowledge you here.While reading Rachel’s blog, I found a post I really needed- how to clean your makeup brushes. I’m embarrassed to admit I cannot remember the last time I cleaned mine- eww! Rachel’s got some great tips and accompanying photos that she kindly agreed to share here. I probably need to add “clean makeup brushes” to my Master List! A long time ago I was about to dish out big bucks on a special cleaning agent for my makeup brushes. As I was hunting for the right one, I got talking to a makeup artist. She interrupted my search and told me of a much cheaper option that works the same. Apparently, the formula is similar to a lot of marketed gentle cleansers for makeup brushes. I can attest to it because I’ve been using this method for YEARS without any problems. Just for kicks, I’ll show you my process. It takes less than 10 minutes. However, if you have heavy build-up on your brushes, it may take longer to wash until the water runs clear. Lay out a CLEAN hand towel big enough to hold your brush collection. Gather the baby shampoo and all your brushes & makeup tools that need a good scrubbing. Start with a small dot of soap in the center of your palm (it’s there somewhere, I promise). Keep wetting and swirling until you have a soapy lather. You may need to add more shampoo if your brush is really dirty. I always give a quick wash on the handle end too. Rinse and watch the bacteria filled bubbles wash down the drain. Rinse & rinse again to make sure all the shampoo product is removed! Repeat the process for each brush, even the eyelash separator will wash up nicely for you. I give a gentle squeeze to drain the excess water and then lay them all out on my towel with plenty of room between each brush for optimum drying. I usually do this shortly after applying my makeup in the morning (and now it’s a new habit I recently hooked) to ensure almost a full 24 hours of drying time. At some point in the day, I turn all the brushes at least once to make sure both sides dry out before the next day. Come clean, have you cleaned your makeup brushes lately? I just recently cleaned mine. I try to remember to do it at least every other month. A lot of times breakouts are due to dirty brushes and the bacteria harboring in the bristles. Be careful not to get too much soap or water however near where the bristles are attached to the brush. This can loosen the glue over time, ruining your brushes. I usually add a bit of water to a small shallow glass, a bit of cleanser (or gentle shampoo), then just swirl the brushes in it. Then rinse holding the brushes, bristles down til the water runs clear. Depending on how dirty your brushes are you will probably have to change out water and the cleanser in the cup a few times. Works like a charm! Reshape bristles and lay flat. Going to check out her blog now. Thanks for introducing us to someone new! Confession: I have not cleaned mine lately! I've been meaning too, but just haven't purchased a new cleaner yet so I'm happy to hear that Johnson's baby shampoo does the trick! Not that I have any of that laying around either, but I'll pick some up sooner rather than later. Ooh, I needed to read this! I've been using my fingers to apply my makeup because my makeup brushes are so dirty. But this looks like an easy way to clean makeup brushes and it's something that I definitely want to try. Thanks for sharing! OK, I can't remember the last time I cleaned my make-up brushes. That can't be good. Oh…and that pizza looks AMAZING!!! Thanks for the reminder! I need to go do this ASAP! Thank you for adding me to your blog roll! I just saw it! This means so much and is an honor to be on your "list!" Mwah! How strange. I just took out all my makeup brushes yesterday so that I would remember to wash them this week. They need it – it's been months. We're in sync, apparently. By the way, you're on my "blogs I heart" list, and you have been for quite a while. Cause I do heart you! Great post! I usually throw my brushes out and buy new ones. Not anymore! Your blog is adorable. I'm terrible about cleaning my brushes but when I do, I use baby shampoo! So much cheaper and already have it on hand! It is so true that it is one of those things you just neglect and forget to do but if you think about it, you really really should! I use my face cleaner to clean them because it is super mild and I have sensitive skin. I could for sure see using the baby soap since it is mild etc. It is expensive to buy the brush cleaner too! Thanks for sharing! Buying makeup online can be easy unlike when you are going to the stores. Thanks for the tips! This is excellent especially to those who want to save on makeup brushes! Lovely! Very similar to the way I clean mine 🙂 and you have a gorgeeee collection! 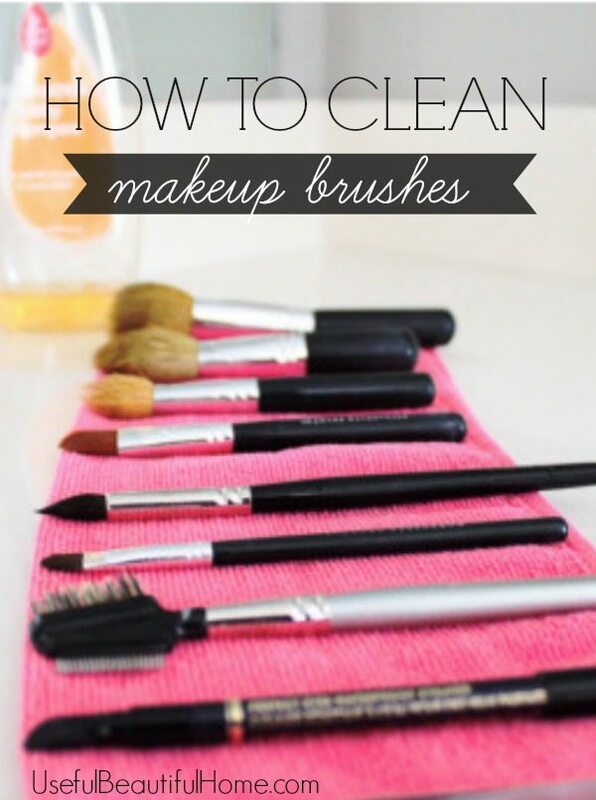 Very informative tips, love to try this tips to clean my makeup brushes..thanks for sharing !